This flagship restoration site is situated in the western part of Austria’s province Carinthia/Austria. 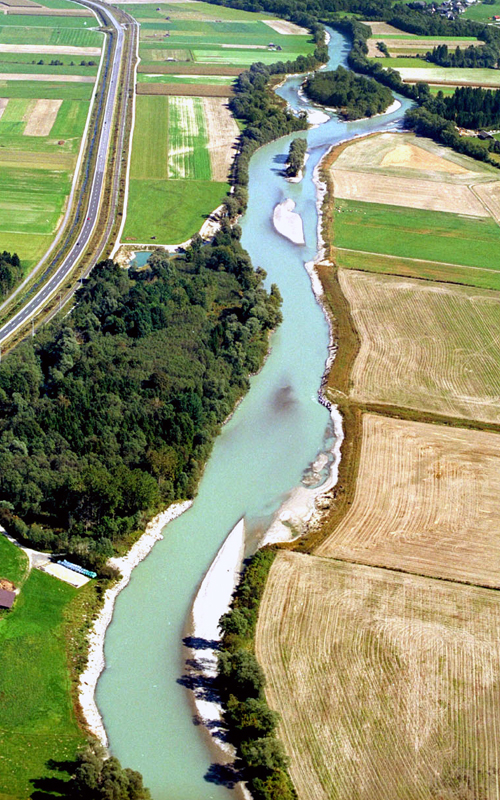 Due to river regulations (straightening, bank stabilization) in the 19th and 20th centuries the degradation of the river bed led to a monotonous river channel and at the same time to the decoupling of the adjacent floodplain. In particular two large side arms were disconnected from the main river-system. The restoration project aimed to prevent further river bed degradation, to re-connect the river with its floodplain area and to initiate the development of typical habitats of the riverine landscape. Bank stabilization structures were removed and the river bed was widened. Lateral erosion increased the sediment input and initialized the development of gravel / sand bars and islands. One of the former side arms was reconnected to the river for annual flooding. The second side arm was widened to a width of 30 m creating diverse instream structures and thus increasing habitat diversity of the aquatic environment. This project was designed to reduce human intervention as much as possible and to promote self-dynamic processes of the river. The project aimed to increase flood retention, to reach good ecological status and to provide an appropriate river landscape for recreational use. The restoration measures were implemented in 2003 as part of the LIFE Nature project “Auenverbund Obere Drau”.